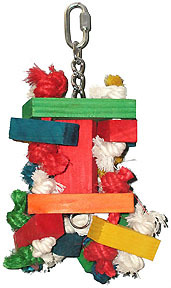 This toy is actually strung on chain with 3 separate block sections from which there are more colorful wooden blocks attached with natural 100% cotton rope and colorful sisal knots. The Block Buster will keep those mega Busy Beaks in your house busy for quite some time! Sized for the larger birds, this is a great addition for their chewing enjoyment! You now have a choice, if you'd prefer the same toy, but not as long, choose the short version! Same great toy, perfect for smaller areas like travel cages and play stands!